Racing in the rain in 2002. Jeff Benjamin has been a Staten Island running mainstay since 1981. 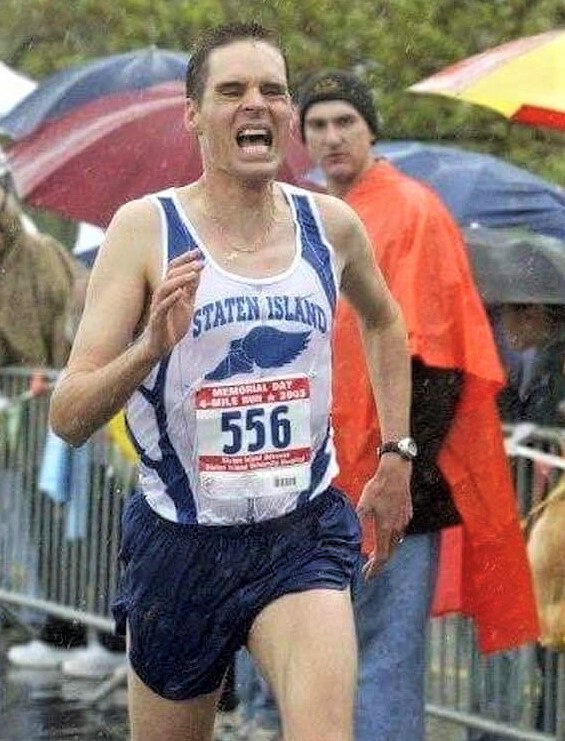 Recently he was awarded the 2019 Staten Island A.C. Lou Marli Community Service Award to the running community. Benjamin will receive the award at the annual SIAC gala on Feb. 16. Past honorees include New York running legends Joe Kleinerman, Kurt Steiner, Art Hall, and Fred Lebow. Benjamin, 53, is also an prolific running writer, who frequently reports on the sport for the Staten Island Advance, Runblogrun.com, and other running publications. Career-profession? I have been an American History Teacher at New Dorp HS since 1997 & have taught in the New York City Dept of Education since 1987. In 1988 I became interested in doing some sort of Track & Field/ Running articles. Fred Lebow was kind enough to provide me with a press credential to the old NYRR NY Games T&F meet held at Columbia University. I’ve done pieces for the local Staten Island Advance (SILIVE.COM), Freddi Carlip’s The Runners’ Gazette, and am now a Senior Writer For Larry Eder at The Running Network and Runblogrun.com which started out as American Athletics Magazine Back In 1989. When did you start running and why? In the Spring of 1981 when I was a 16 year old Sophomore at Susan Wagner HS I watched from the stands as a teacher named Steve Lerner was running laps on the old black asphalt school track. I decided to join him even though I was wearing jeans, and I completed 5 miles (20 laps) that day.